And with that…I’M BACK! Open the vault and let out the monstrous dust bunnies and thorn filled tumbleweeds of DOOOOOOOM! Now THAT’S some 2000s casting right there! I remember first watching this flick with friends during High School as part of that special time where special previews were all the rage at our local movie theater. Essentially, you get to watch a free movie that doesn’t come out for months and the only catch is filling out a questionnaire and/or answering some questions about the flick. I believe it was one of my early experiences with pre-screenings so this flick always held a special place in my heart. Although there have been plenty of movies where the backdrop was the desert and psychopathic killers were on the hunt for some innocent folks, Joy Ridebrought a factor of fun and even a hint of zaniness (mostly due to the wonderful Zahn) that made the tense moments even better. 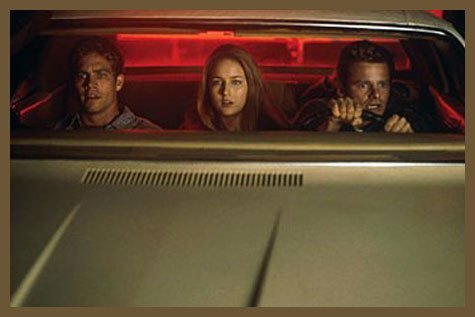 The flick is simple enough, two brothers embark on a road trip to see a girl when some badly timed road hijinks involving a CB radio lures out a psychopathic killer that’s relentless in terrorizing the brothers. What the film does well is how natural it builds into chaos. 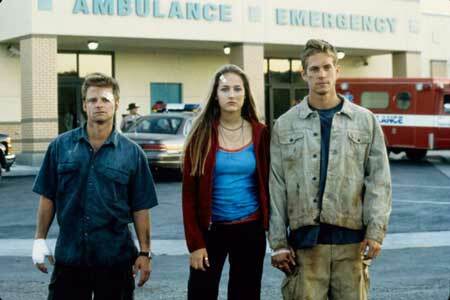 Paul Walker (Rest in Peace) plays the perfect straight guy to his brother’s ridiculousness and their relationship is established early. As the flick plays out it’s no surprise that Zahn decides to play a prank in poor taste to taunt a lonely truck driver. From there the fun stops and the film progresses to get creepier and then eventually turns to entertaining suspense. Once the premise of a spurned truck driver is seared into your head, the film evolves into a slasher of some sort all within the setting of a desert where help is scarce and a giant 18-wheeler is king. The huge truck that the mysterious driver named Rusty Naildrives is pretty much his version of a machete. Every slasher has their signature weapon and in this flick, Rusty Nail uses his giant truck as an extension of himself which results in some really entertaining scenes of stalking and builds the tense moments before the eventual violent release. What would I do in this situation you ask? Well, knowing myself, I’d be the guy that played the ill – advised prank so I think apologies would be in order. 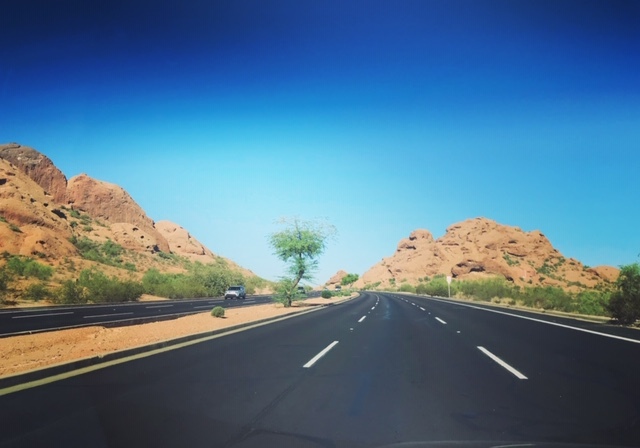 Of course that wouldn’t work so as I drove down the lonely roads in the desert, the idea of driving off – road or calling for help on my cell crossed my mind but then I’d look over at my phone and I’d be lucky to have one bar. So where does that leave me? Yes, I’ve even suspected on taking on the killer myself by driving off the path and perhaps setting a trap for the killer…then I realized I don’t have that in me…or do I (Insert maniacal laughter here). The last six months traveling through various desert areas brought some great beauty but I’m glad to know that my brain still turned to the one place where it’s comforted the most; my precious horror flicks in my most coveted vault.